As the furore surrounding Cambridge Analytica’s acquisition and use of people’s personal Facebook data has grown over the past few days, thousands of people have taken to social media to announce that they’re deleting Facebook. Social media listening tool Sysomos reports that people have posted more than 400,000 tweets containing the #DeleteFacebook hashtag in the past 30 days, with Twitter users in the USA and the UK responsible for more than half of those posts. The sheer volume of these dramatic declarations seems to have worried Facebook’s investors, while the related media stories inevitably played a part in fueling the $58 billion drop in Facebook’s stock price last week. However, when we dig into some other Facebook data, a different story emerges. Interestingly, Facebook’s latest monthly active user (MAU) numbers suggest that very few people — if any — have actually ‘deleted’ Facebook. Indeed, the latest data suggest that more people than ever are using Facebook. The USA and the UK have seen strong growth in Facebook user numbers in recent weeks, despite being home to the greatest number of people claiming that they’ll #DeleteFacebook. Active Facebook users in both countries have grown by more than four percent since January this year (i.e. in the past 90 days), while the number of people using Facebook in India has jumped by 12 percent in just three months, despite Twitter users in the country posting more than 30,000 tweets containing the #DeleteFacebook hashtag. MAU numbers don’t tell us what people are actually doing on Facebook though, and some of these active users may have logged in to their Facebook account simply to adjust their privacy settings. Also, despite the healthy growth in Facebook’s MAU numbers, it’s worth noting that trends in the data that I collect as part of my ongoing series of digital studies show that people are using Facebook less frequently than they used to, and the amount of time that people spend on the platform during the average visit is also decreasing. This is part of an ongoing change though, and isn’t solely attributable to the Cambridge Analytica affair. What’s more, using Facebook less is very different to stopping using the platform — let alone deleting it. This MAU data is published by Facebook though… could it be that someone has ‘polished’ these numbers? Other data from reputable third parties suggests not. The latest data from App Annie suggest that there was a significant drop in Facebook app downloads last week, but that this trend has already reversed, and download behavior in both the US and UK already seems to have returned to levels similar to those we saw prior to the latest wave of Cambridge Analytica stories. Android users seem to have been more unsettled than iOS users though, with the Facebook app dropping 27 places to 36th spot in the overall US Google Play rankings between March 6 and March 21. For reference, Android accounts for about 45 percent of all handsets in use in the US, according to the latest data from StatCounter. However, by March 25, the Facebook app had bounced back to 5th place in the US Google Play rankings – even higher than it ranked before the media circus of recent days. The swings in Facebook app downloads in the UK were even more dramatic, with App Annie reporting that Facebook lost 46 places in the overall UK Google Play rankings between March 9 and March 22, from 12th to 58th place. However — just as we saw in the USA — UK download figures bounced back over the weekend, and the app was back to 15th place in the overall UK Google Play rankings by Saturday (March 24). Again for reference, Android accounts for roughly 46 percent of mobile handsets in use in the UK today. Given the widespread concerns surrounding the Cambridge Analytica affair, it’s perhaps unsurprising that Facebook experienced these significant drops in app downloads. But did people go so far as to actually delete the Facebook app from their phone? The simple answer: no. Far from it. 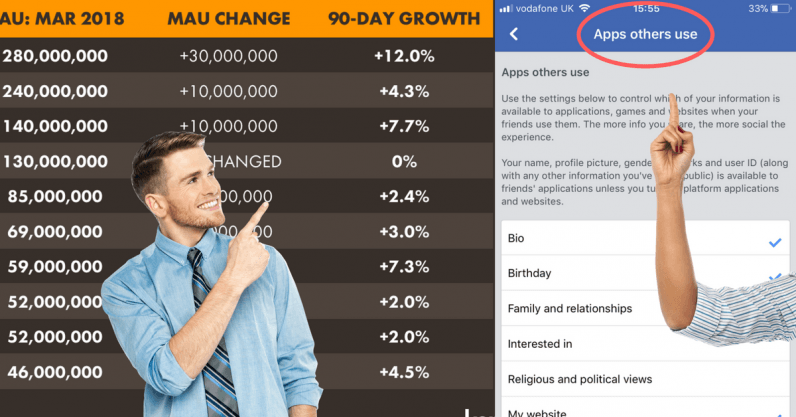 The latest data from SimilarWeb’s ‘App Usage’ rankings suggests that — over the past 30 days — Facebook’s app has been the most used mobile app in any category in both the USA and the UK. None of the data suggest that Facebook Messenger has been impacted by recent controversies, either. So, if you didn’t #DeleteFacebook, don’t worry — you’re not alone. The simple reality is that Facebook is now an integral part of everyday life for more than two billion people around the world. We may be worried about the implications of the Cambridge Analytica story — and what it means more broadly for our data privacy — but it’s unlikely that Facebook will lose a meaningful number of users because of this episode. So, if you’re going to keep using Facebook, what can you do to keep your data safe? Facebook is designed for sharing, whether that’s you posting photos of your lunch, or Facebook sharing targeting data with advertisers and behavioral data with app developers. Most of this data sharing is integral to the core Facebook experience, but there are a few aspects of Facebook’s sharing functionality that may surprise even the most cautious of users. In particular, in order to allow users to play social games and communicate with each other across third-party apps and services, Facebook makes certain aspects of our personal data available to developers when our friends use apps, games, or websites. The principle behind this functionality has clear social benefits, but it’s the sheer volume of data that Facebook makes available that may surprise you. Details of which data elements Facebook makes available to third-party developers are tucked away inside the settings menu, in a sub-menu called ‘Apps others use.’ It’s interesting to note that this menu doesn’t feature in the current version of Facebook’s ‘data privacy review’ walk-through. The image below shows which elements of your Facebook data the platform shares with these third-party developers — note that everything with a check mark (‘✓’) is on by default for all users. In other words, unless you’ve specifically changed these options, Facebook makes all of this data about you available to the developers of apps, games, and websites that your Facebook friends use, even if you don’t use those services yourself. Functionality like this enabled the developers of the psychology app embroiled in the Cambridge Analytica affair to access their users’ friends’ data, so you may want to review these settings on your own account now. Fortunately, just a few tweaks should significantly reduce the amount of your data that Facebook shares with third-party apps, games, and services, so there shouldn’t be any need for you to #DeleteFacebook anytime soon.